This morning was cold, very cold, -7C (19F) cold... So I let myself linger under a blanket for a few extra minutes before I rushed myself out of a bed. Then I had my traditional ritual "wake me up" dance (you know, the one when you move all your limbs in different directions), which this morning turned out to be a "warm me up dance". You know I am not a morning person, not at all. And my kids, bless their hearts, have been so kind to let me sleep just a little longer, like 2-3 minutes longer on a school day mornings. Today when I finally got out of the bed and came to the dining room, the teenager was doing the same "warm me up" dance. After a quick breakfast we left for the car, continue moving our limbs, almost performing a break dance on a parking lot. That's when I thought of something warm and comfortable for lunch, and Everything Roasted Warm Winter Wheat Berry Salad idea came to me. Cut fennel, carrot, red pepper, turnip, parsley root and squash into wedges, place in a large bowl, add dried herbs and olive oil, and mix. 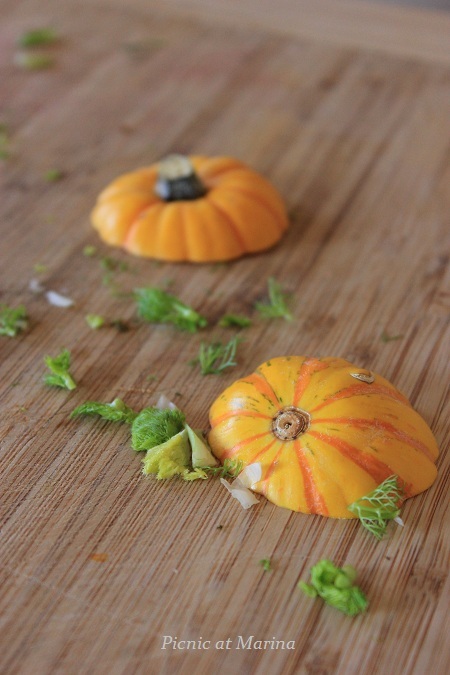 Transfer all vegetables to a baking sheet, and bake 25-30 minutes. 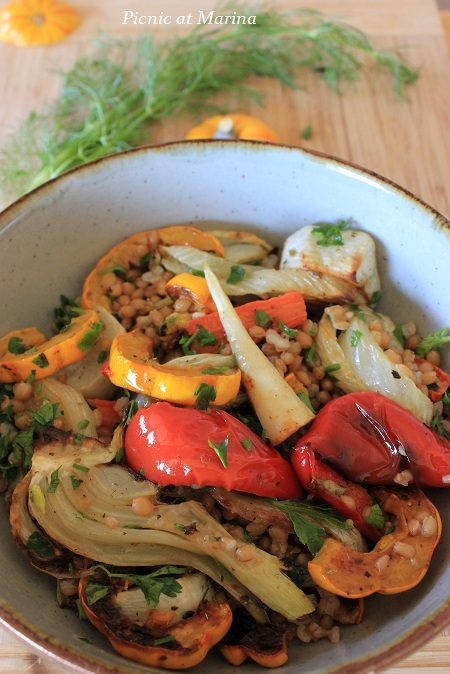 Mix roasted vegetables and cooked wheat berries with lemon juice and chopped parsley. Sprinkle with chia seeds and serve. 1. Dry wheat berries take a long time to cook, about 2-3 hours. If you pre-soak it for 8-10 hours, the cooking time will be reduced 30 minutes. 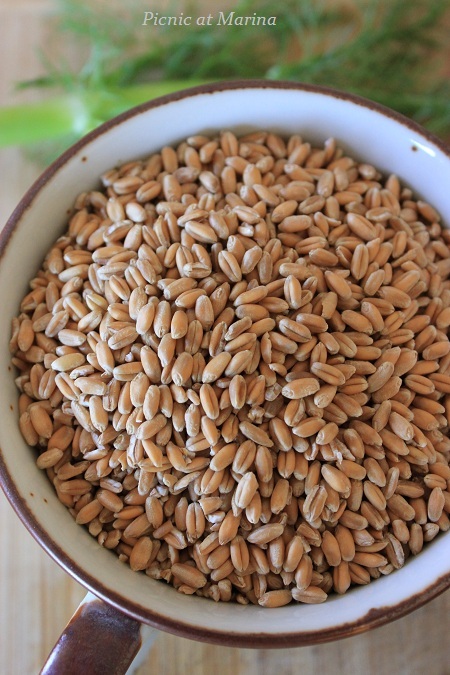 I usually pre-soak wheat berries from 10 to 24 hours, rinsing it a few times before cooking. Then I keep cooked wheat berries in the refrigerator and add to my soups, salads, breads, and etc. 2. This recipe has no salt in the ingredient list as it doesn't need any: you have all that flavor from the dried herbs, enhanced by the heat, plus lemon juice and fresh parsley. However, if you wish to, you can add salt and pepper to taste. Now, I am off to another dance, a happy belly dance! You found fennel! Good news. ;-) And a terrific looking salad. I love roast veggies, and this is a great assortment. And the wheat berries are a fun idea. Good stuff - thanks! Dancing does warm you up! And this meal looks like a winner for a cold winter day! Enjoy your evening! What a pretty dish. Looks delicious! I love roasted root vegetables. Winter Red Wheat Berries is new to me. I love this dish Marina! It looks rustic, wholesome, healthy... and sooo yummy!! I love fennels. Have a great weekend! This looks delightful, warm, and comforting! We have a chill in the air, too...and I good really go for something in the way of comfort food. I was planning to make a similar dish this weekend except with Israeli couscous. I'm going to take a few ideas from your yummy recipe and combine them with mine! Happy weekend, Marina! A wholesome, healthy and good looking salad. Have not worked with wheat berries before, must make amends. Everytime I read a recipe that calls for chia seeds, the chia pet commercial pops into my head. I've not done much with wheat berries yet. I bought some once to use in a meatless chili (I'll give that recipe an "eh"). This sounds much better. Thanks for the idea. Marina, I love this roasted lunch idea! I don't know why but I keep on seeing such dishes during the summer and never in the winter, but, as you say, it must be very warming! 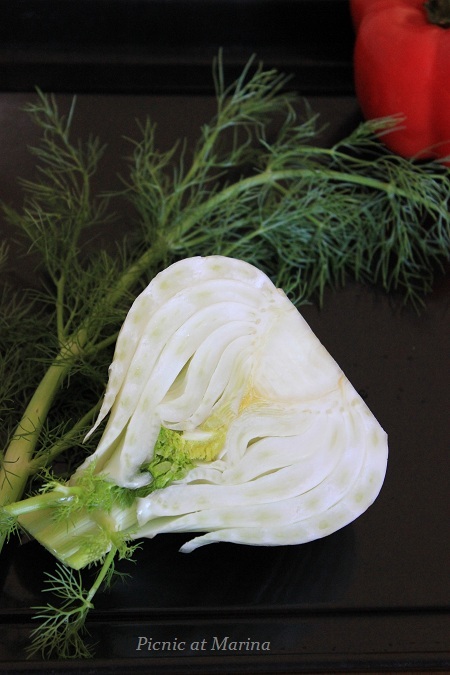 I love the fennel photo! Marina it's stunning! I love love love fennel. A total fave! And with those wheatberries and roasted red peppers, what a scrumptious meal! And the squash, too. And such pretty pics! Looks like you came up with something wonderful - it would definitely make me do the happy dance too! Love the pretty colors and textures! Not big on fennel, but the rest looks tempting! Now I can talk a little, but my girl is sick, she has angina-(( We have such a gold weather also and windy. I made a big pot of "mors" today for my kids and cooked a little. I like roasting vegetables in winter, yours look really good. Simple and delicious dish, well done Marina and thank you for your friendship! Hi Marina! I love roasted veggies, and so happy to see my favorite fennel bulb in this. :) I love using it for soup but haven't tried roasting them. This sounds healthy and delicious! Now this is a great way to fight off the cold. It has been brutal here too...but finally warmed up this past weekend. Thank goodness. But I still feel like roasted veggies and this salad will do my body good! Thank you for sharing! I hope you are having a lovely week! Roasting vegetables makes their flavors even more intense! This salad is ideal for temperatures like the ones you describe! Your salad sounds good. I have had wheat berries but have never cooked them myself. Thanks for the soaking tip. I LOVE your salad, this is my type of food (unfortunately, my husband and boys are less keen on veggie wheat salads....). 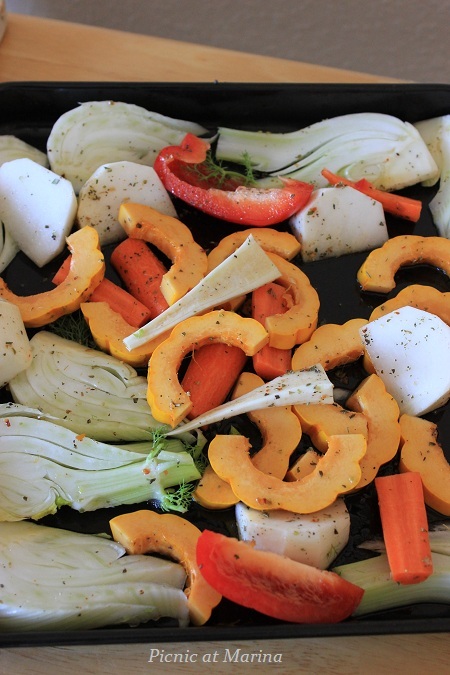 Roasted vegetables are delicious combined with salads...this will be soon on MY menu!